Discussion in 'Future of Trek' started by Lord Garth, Dec 12, 2018. How much of The Future in "All Good Things" could work for the Picard Series and how likely would these things be? Here are my guesses. It'll be interesting to see how much of this turns out to be right or wrong. Was Picard an Ambassador? I think it's possible and he might even still be one in the "real" 2399. But I only think it's possible. He might be doing something else. Does Picard have Irumodic Syndrome? I think it's possible, but I'm leaning towards probably not. Or maybe he does because it adds something to the character. Like it's something he has to fight. So I guess I'm split on this. Is Picard tending the Vineyard? Hmmm. I wonder if the Vineyard is even still around after his brother died? Are Picard and Crusher divorced? I don't think they ever even actually got married but, either way, I'm guessing they're not together. Have relations between the Klingons and the Federation deteriorated? I think technically it's possible but not likely. I say that because it would be too much like DSC. Is Troi dead? Probably not. Marina Sirtis would jump at the chance to appear and the writers know it. Is Worf a Klingon Governor? Probably not. He was a Klingon Ambassador and if Nemesis is anything to go by, it doesn't look like Klingon politics agreed with him, so he was back on the Enterprise. Is Riker an Admiral? Probably. Is Geordi married to Leah Brahams? Yeah right. I think that was a pure fantasy! Is Data back and working at Cambridge? Good luck getting Brent Spiner back in front of the camera as Data. Is the Enterprise-E still around? I think it's been decommissioned. I'd be surprised if it's still around. Maybe the ship is just being decommissioned. I don't know. But, either way, I don't think Picard's been Captain for a while. How much do you think of "All Good Things" will be in the Picard series? Was Picard an Ambassador? I'd like to see the series be his last mission as an ambassador before finally retiring due to health issues. Does Picard have Irumodic Syndrome? This would make for a great character-driven story, a great man brought down by his own body, trying to keep himself going for one last vital mission for the Federation before he retires, looking back on his life and everything that made him the person who he is. Unfortunately not enough explosions or grittiness so it'll never happen. Is Picard tending the Vineyard? I'd like to think he'd retire to the family home to see out the remainder of his days. Are Picard and Crusher divorced? I think they may have tried the whole marriage thing, but realised they're better off friends. Have relations between the Klingons and the Federation deteriorated? Doubtful, the Federation and Empire were in very good terms last we saw them, so I suspect that would continue. Is Troi dead? I'd have her as the Captain of the ship Picard is on for his last diplomatic mission, there to offer him the support he needs to get through. Is Worf a Klingon Governor? I'd like to think he'd return to be the Federation Ambassador to the Empire, there really wouldn't be anyone better for the job (especially if Martok remained the Chancellor). Is Riker an Admiral? He retired to look after the children he and Troi adopted, turning his back on what he thought was the most important thing in his life (his career) to focus on what really is. Is Geordi married to Leah Brahams? Maybe not Leah, but I'd like to think he did finally get lucky and then starts teaching at Starfleet Academy after retiring as Captain of the Challenger. Is Data back and working at Cambridge? Data is dead. B4 was taken to Commander Maddox at Starfleet Science for study, which has led to a new wave of Soong-type androids being used across Starfleet. Is the Enterprise-E still around? Yup, she'd only be about 25, so probably has undergone a few refits over the years and now has an all new crew onboard doing her name justice. We wouldn't see her mind you, the galaxy is a big place after all. The 1701-E would be 27 years old in 2399. That's middle aged for a capital ship in real life, but Trek is really inconsistent about when a ship is obsolete. 27 is young compared to all the Excelsiors and Mirandas in DS9, but old for an Enterprise. Only the 1701-null and (probably) 1701-B stayed in one piece for that long. Also, looking at that chart makes one wonder why anyone would want to serve on an Enterprise, when there's a >50% chance the thing will be blown apart within a decade. Taking a step through the 4th wall, I don't think the E-E has aged at all. You may not like the design, but it's rather timeless. I'm not sure you're accomplishing anything with a new ship. Not that it's stopped anyone before. I think the only reason to believe the Enterprise-E will be around is because John Eaves is doing the art for these shows, and the 1701-E is his baby. Data: not sure they're going to go anywhere near that. Geordi married to that woman he creeped on? I hope not. Riker? Yes, an admiral. A fat admiral wishing he stayed on the bridge. So busy. Much regret. Very grizzled. Worf? No idea, but he not a good diplomat. He's killed 1 head of state and 1 claimant to head of state. Troi? Not dead. Her mom is, to Picard's relief. Picard: not sick, only tending grapes once a season to demonstrate him taking a break and returning to his home. This is Star Trek, not Farming Simulator. Probably not divorced or even married, if only because they seem like they don't want to bring back Beverly...or anyone else. Which is weird for a nostalgia romp like this. No idea what JLP's current job is. Q: still awesome. Currently pulling the wings off the fly-people of the Andromeda Galaxy. He'll put them back when he's done. Don't get me wrong. I like the Enterprise-E. I was just wondering if they might want a new Enterprise for the new series if they ever have it appear. Kind of like how they changed up the Enterprise in Discovery, so CBSAA would have its own "TOS Enterprise". Likewise, I'm wondering if they want their own "TNG Enterprise". But since John Eaves designed the E-E, technically it's already a TNG Enterprise with his own stamp on it. Though maybe he'll want to improve upon it. The Enterprise-F is in Star Trek Online so not having it in the Picard Series would probably make them happy since it wouldn't be introduced 10 years early. Bring on the three nacelled E-E! Mr. Laser Beam, mos6507, Bry_Sinclair and 2 others like this. I'd love to see Q back too, but I'm afraid his character would only works if it's played by John DeLancie. If he's recasted, I'm not sure whether the new Q will be as fun to watch, as DeLancie and SirPatStew worked well together . Star Trek Online doesn't exist outside of its gamey little bubble. If there's a 1701-F, that won't be the design. A 1701-E reboot is a possibility. I'd be cool with that. Just like how it's exciting to see a new take on the TOS design we saw for 72 episodes, it'd be cool to see a new take on the last Enterprise that mattered. Which is all quite silly, since we see in "E2" that a heavily damaged Enterprise NX-01 survivied 120 years in the Delphic Expanse and more recently in "Calypso" that the USS Discovery NCC-1031 survives 1,000 years just waiting for something which may or may not be revealed in future episodes. And she was in mint condition! The Enterprise-E should still be in service by 2399, although I suspect 25%'d like Pike's Enterprise. I expected them to recycle Discovery sets (which don't look that different to TNG-movie era stuff) for ship scenes but apparently they'll filming Picard in LA so wheatever they build will be from scratch. SolarisOne and Burning Hearts of Qo'nOs like this. I'd love to see a E-E refit. And to go all out with lovely wood paneling anywhere they can! And potted plants in hallways! That's what Star Trek is *supposed* to look like to me lol. Honestly, the E-E with three nacelles sounds better the more I think about it. This keeps getting brought up, and I keep saying the same thing: there's no reason why DeLancie can't reprise his Q role. He can make himself look any age for any reason. He could even throw in a jab and say "Why, my dear Jean Luc, I chose this appearance to show you what aging gracefully actually looks like." And given that Stewart likely has creative control over the series, I would think he'd be the first to call up DeLancie to see if he's interested. SolarisOne, Deathlok and Burning Hearts of Qo'nOs like this. 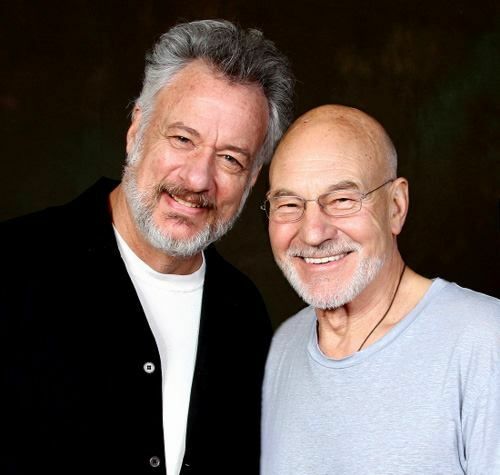 John de Lancie has said he's not interested in playing Q anymore. Like Spiner, he feels he's too old to play an ageless character. "Why, my dear Jean Luc, I chose this appearance to show you what aging gracefully actually looks like." I wonder how they'll go about Starfleet uniforms. I've never been a fan of the alt-future pajamas, but a redesign of them with the broad strokes I would accept. I've always been a fan of the alt-future badges, so I hope to see them again. The pajamas were a projection of what TNG would look like in the future (dominant department colors), but then eventually the First Contact uniforms took over, so I would think that if they would go for future projections of that style. The franchise has gotten pretty diverse with their uniforms (which we saw early on with all the lovely FC/DS9 variations, eventually leading to the 60-something different types of uniforms we find in the Kelvin timeline), so I'd assume we'd see an evolution of the First Contact style...a 10-piece ensemble with 4 different parkas, lol. There's nothing particularly outdated about the look of the 1701-E. The only thing I didn't like about it was the aztek job which was sort of randomized and looked sloppy up close. Wasn't Patrick Stewart also on record saying he was done playing Picard, before someone threw him a huge bag of money -- er, I mean, pitched him a great idea for a character revival story. Actors can, and often do, change their minds for whatever reason, particularly when there's an easy paycheck involved. wayne66 and picardjean-luc like this. Best news I've heard around this series. I don't know why, but I hope Picard is as far away from Starfleet as possible at the beginning. Far away not meaning distance-wise but mentally. There's nothing more different than that. EDIT: Maybe I do know why. Starfleet is the Not-Military (the "not" being about as believable as "asking for a friend"). Star Trek's focus has always been the Not-Military. If Picard's truly a pacifist, a diplomat, explorer, whatever, he doesn't need to be part of the Not-Military to do that. He doesn't need to work for them to keep doing what he really wants to do and might want to do more of, even if through different means. SolarisOne and The Wormhole like this. My current theory is Picard has become Boothby 2.0 and tends the Starfleet Academy grounds. danellis, picardjean-luc, Ovation and 1 other person like this. Flagship captain to groundskeeper? Not quite the promotion he probably expected. picardjean-luc and Lord Garth like this. I agree, the 1701-E is in no way dated. Mostly because it's the same postmodern style that we're still using today. The TOS 1701 is very postwar futurist, which sticks out unless your whole show tries to fit that style. Going postwar modern isn't a wrong choice. It will give you an anachronistic feel almost like a period piece. Some shows/films have done that. Kubrick's 2001, for example. It just wouldn't mesh with the tone they were/are trying for in Discovery. So, yeah, the Discoprise was more "necessary" for a coherent Discovery than a 1701-E redux would probably be for Picard Trek. That doesn't mean they won't do it. Like I said earlier, the best case against a complete re-do is probably that John Eaves will be working on it (again). But there's no guarantees either way. Maybe Johnny wants to start from scratch again? Maybe he'll be ordered to. I think it has to do with the perceived marketing value of nostalgia of carrying over the E-E vs. the hype of a new ship design. The E-E has sort of a mixed reputation with Trek fans. I like it aside from the small dish which I feel is out of proportion to other ships. But I have ZERO faith in today's crop of art designers (other than maybe the STO people) to make anything better so I'd rather they stick with it. Prior to CGI old ships would have longer service lives to keep the budget down on Trek. But now there's no interest in holding onto assets from earlier productions and so it risks giving things too much of a disposable feel.